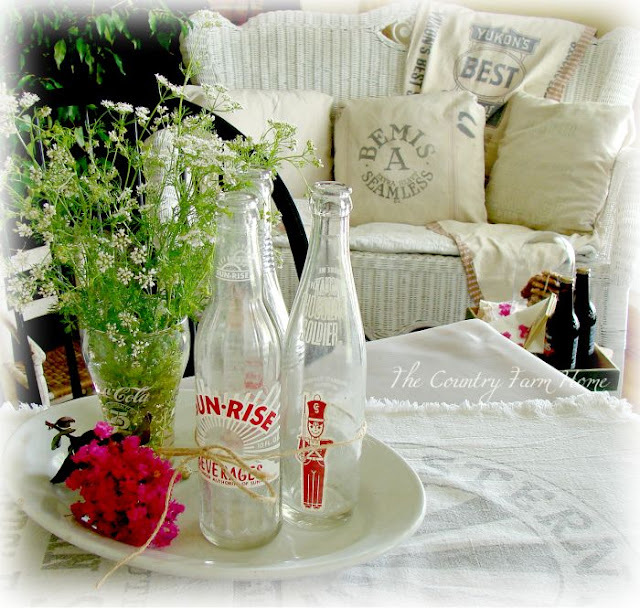 I really admire the ability to find a random vintage item and then transform it into something new and different. Betsy from My Salvaged Treasures knows how to think outside the box in giving her vintage items a whole new look and purpose. Last week she shared how she created this wonderful upcycled photo and jewelry display from a shelf of an old baker's rack. that became a flower container. She recreated a retro bench with a fun Union Jack pillow cover. and old industrial office accessories are updated with numbers. Thanks for giving us such great inspiration each week, Betsy! a relaxing seating area in her summer Keeping Room. Carol's home from Art and Sand is alive with wonderful color. Have you seen her hubby's amazing paintings? 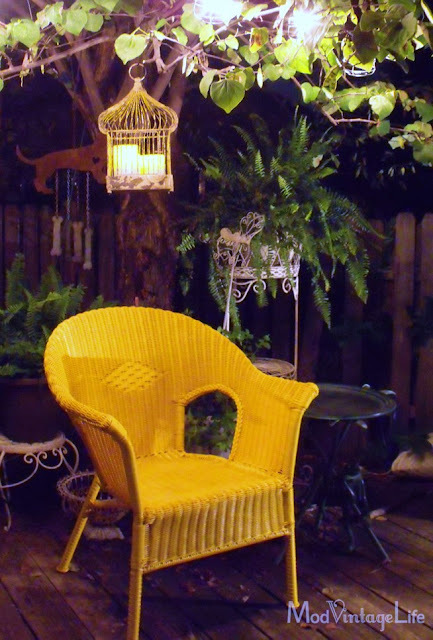 Yes, a Vintage Birdcage with remote control candles. from Anjana At the Corner of Happy and Harried. thanks gals, for sharing the inspiration! French Bleu Vintage is in the Sponsor Spotlight today and most of you are familiar with Dee's wonderful Shop. She's been marking down some beautiful items in her French Estate Sale Department, so run over for a look to see the bargains. And while you're there, be sure and browse the rest of her shop for some amazing vintage finds. If you've been featured then feel free to grab the image below. 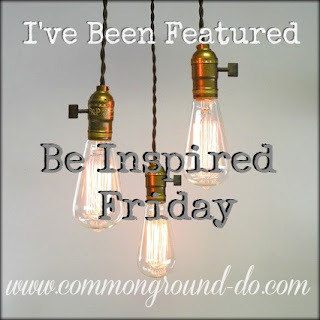 OK, Time to link up all your ideas and inspiration, vintage goodies, projects, DIY, crafts and recipes that you've been working on this week. Please be a follower of Common Ground, and please take a minute to be sure you have a link within your post to be featured. Thanks SO much for the feature Debra - by hit the road - did you mean Hit the road Jack and don't you come back no more no more LOL??? You're the best - and of course thanks so much for the party! Wonderful features Debra! Thanks for hosting! Oh I love all the featured links this week. Thank you so very much for hosting. I am always so glad to be able to join in on the fun! So many great summer blog posts this year! I have really enjoyed them! Thanks for hosting and for joining Home Sweet Home! Mesmerized by the hubby painting of the truck!!! Clever idea using the vintage baking rack!!! Love, Love, Love the pillows on the wicker settee!!! Thanks for hosting Be Inspired Friday each week. . .inspiration abounds!!! I love Betsy's repurposing ideas and makeovers. The other features are wonderful as well. Thank you for hosting the party, Debra! Love the colorful painting on the vintage truck...just beautiful! Thank you so much for hosting Debra, have a great weekend!!! 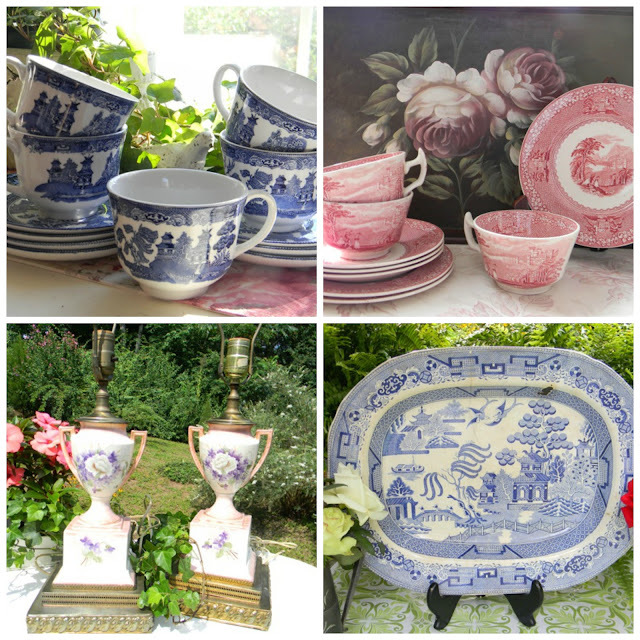 Hi Debra, I love salvaged treasures! Great features. I missed a few and will be back to do some pinning. Thanks for the painting. I love Carol's hubbies paintings! Betsy creates some of the most creative things! Great features and thanks for hosting Debra - I'm linked up! Thanks for having us, Debra! It's always fun to join in the party. Thank you so much Debra for featuring all my savaged treasures. Carol's husband is a very talented artist indeed! 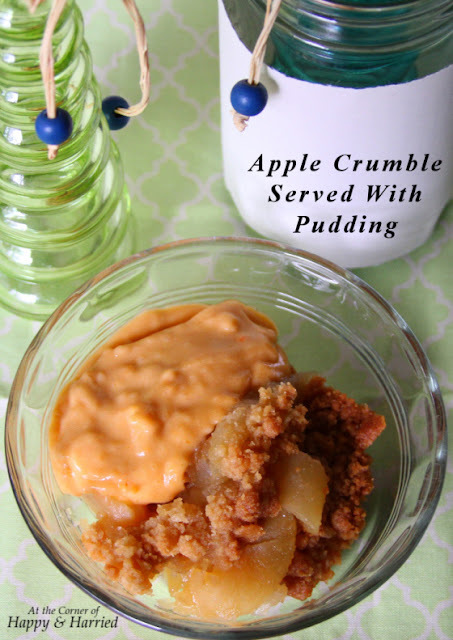 That apple crumble is a real tease especially right before lunch. Thanks so much for hosting every week!! Inspiring features! I especially like the birdhouse idea. I'm going to copy that one! You always have the best features! That Betsy "gets er' done. And when I see Art And Sand I feel like I'm looking inside a crayon box. So many great features! Thanks so much for hosting. You have really nice features! Love the office stuff! Bless your heart, Debra!! Just "the hostess with the mostest" gathering great ideas from other bloggers to showcase in your party! Just love that! So many ideas and always something for everyone. Thanks for everything! Who knew that gray could make you so happy? Love the posts tonight. Thank you for hosting. Happy to see that you featured Betsy...she always has so many neat ideas and she is one SWEET gal. I am just catching up with all of your fabulous features and yes I AM inspired. Thanks so much for hosting Debra!!! Thanks for hosting Debra. 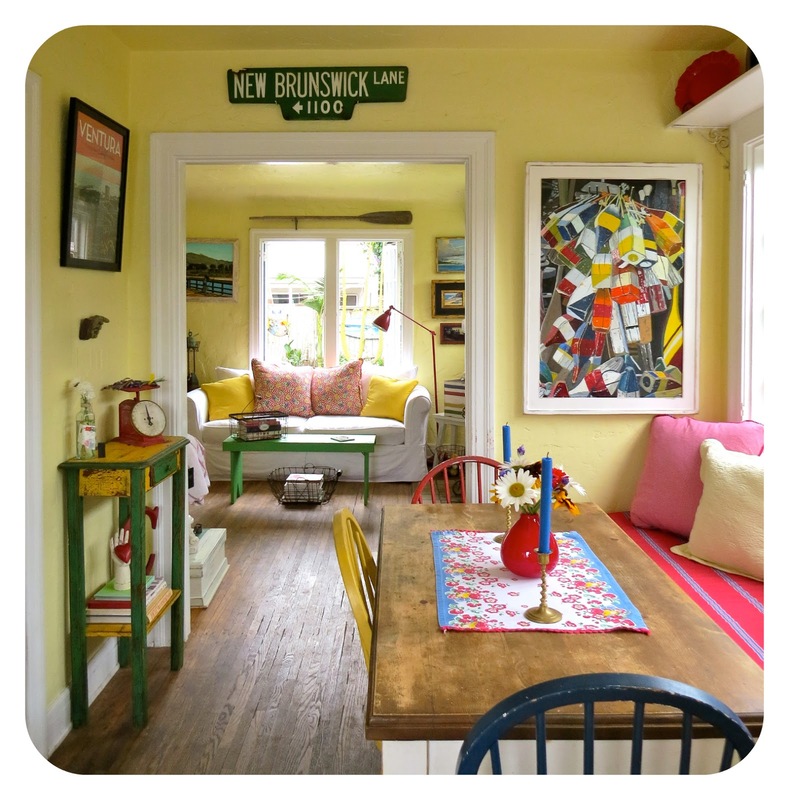 I'm just drooling over Betsy's salvaged treasures! Hi Debra, Thanks for hosting and sharing all this amazing inspiration. Thanks so much for hosting and letting me join in. The features are just remarkable this week. The painting in stunning. Thanks so much for including me (and Steve) in your features. I am honored to be teamed with some of my favorite people - Betsy, Suzan and Dru. Thanks too for hosting. I am working on my post right now, but popped in to see if the party was up. Love these features, Debra! Absolutely wonderful! Gorgeous features!! Thank you so much for hosting. Have a wonderful weekend. LOVE LOVE the bakers rack, and the industrial office organizers. And basically everything. haahaha! Thanks for hosting the party! Wonderful features this week, Debra! Thanks so much for hosting. 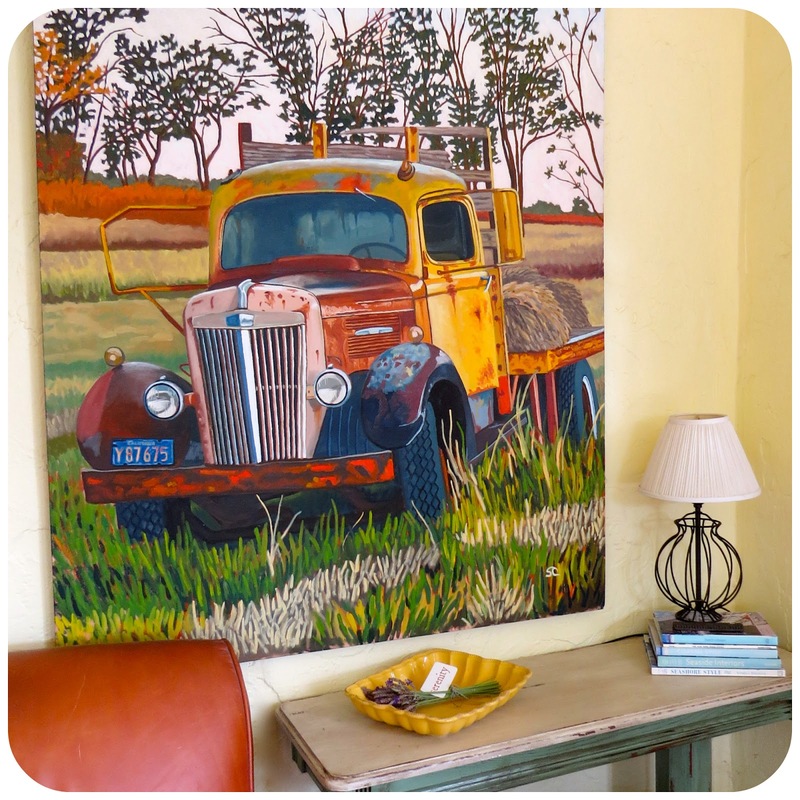 love this week's features, debra:) isn't that truck painting amazing?! thanks for hosting, and have a great weekend!! Thanks for hosting and many thanks for featuring my appl crumble recipe. I am so honored and thrilled! Debra, Thanks so much for hosting every week. Love coming to your fun parties. I'm always inspired by everyone's creativity! Thanks for stopping by Debra, loved having you! Loved all your features, I've been really lazy this summer with posting so I'm hoping with the grands going back to school in two weeks I'll find more time. It's been a busy but fun summer. Hi Debra, I'm just linking up now --a bit late- and I see I'm in some wonderful company. I'm so glad you featured Carol's house. Isn't her husband's art amazing? And I always love seeing Suzan's projects. Patrick just turned 21 years old and I'm still a bit in denial but I linked up his birthday dinner. I hope you get a kick out of it. Great...great features!! Thank you for hosting such a wonderful party!